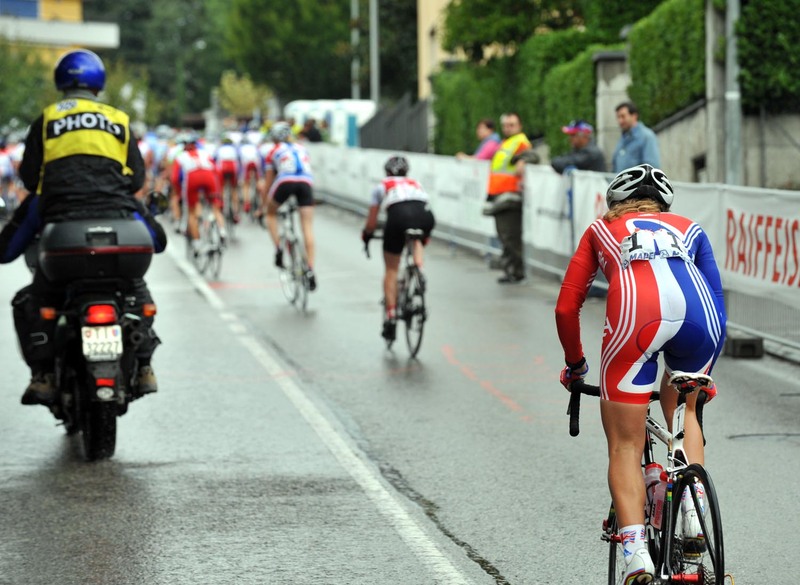 Italy’s Tatiana Guderzo soloed to victory in the women’s road-race on Saturday, whilst Great Britain’s best performer, Emma Pooley, finished fourteenth. Nicole Cooke abandoned mid-way through the race. Guderzo’s victory came after an attack over the tougher of the two climbs, shattering a 17 rider front group. Second for the second year running was Marianne Vos (Holland), the strongest of a three rider counter-attack. Noemi Cantele, already a silver medallist for Italy in the time trial, took bronze after shadowing Vos and American Kristin Armstrong behind her team-mate for the last 10 kilometres. Defending World Champion Nicole Cooke abandoned with four laps to go, riding out of the race alongside team-mate Katie Colclough. Cooke had hinted the previous evening that despite working hard on her build-up for the Championships, her condition was perhaps not as good as she would like it, and she eventually opted to quit. Despite Nikki Harris being involved in a crash early on, with initial reports saying she has a suspected broken collarbone, Great Britain and Germany worked hard early on to toughen up the race. On a gruelling course the strategy worked well, with the front group down to less than 40 with three laps of the 13.8 kilometre circuit to go and half that number a lap later. Pooley was constantly close to the front, but it was a move by Guderzo on the second last climb of the race that proved decisive. Vos worked hard to try and pull back the break, but Guderzo had not taken a bronze medal on the hilly Olympic course last year in Beijing by chance and Cantele did a brilliant job shadowing the Dutchwoman. Pacing herself steadily on the final climb, Guderzo looked behind several times, but in fact the chase gruop had dropped out of sight. Just a few minutes later she soloed across the line for Italy’s first gold medal of the 2009 World Championhips. 10. Catherine Cheatley (New Zealand) at same time.